6+ yrs of exp in UI Development and strong exp in node.js. Strong experience in Scala programming. Experience with design and building data pipelines for processing datasets using Spark. Strong concepts on Relational Databases. Experience in developing and validating proof of concepts. 3. Should have experience in setting up the Tableau environment (Installation , setup, configuration of clustered environment). - Comfortable at defining ETL requirements and specification document. • Building cutting edge User Interfaces with Node.Js . You must be following and will be updated about floods and disaster created by it in Jammu and Kashmir. People have lost everything even basic and daily necessity things/materials. The upcoming winters are only going to add to this unexpected calamity. 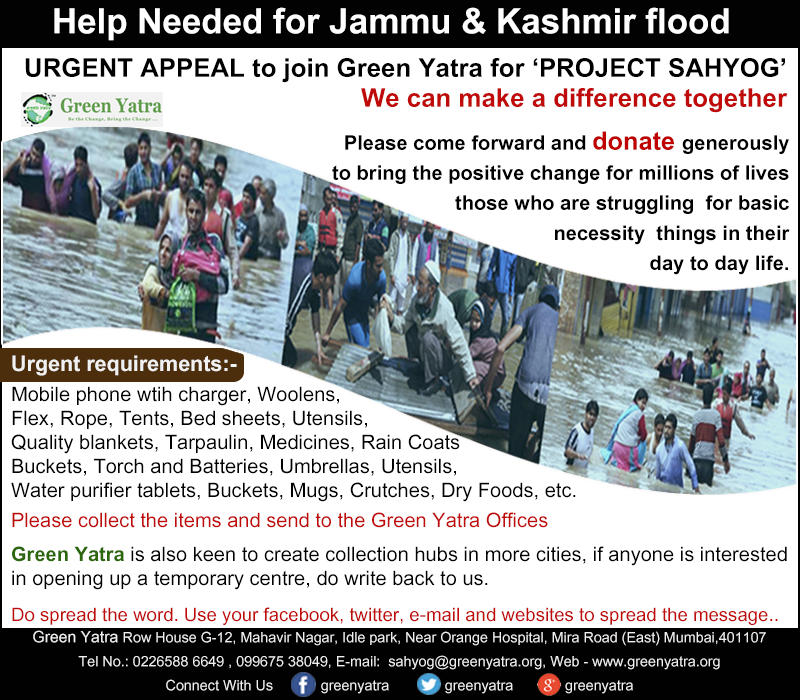 Green Yatra is trying its best to reach out relief in J & K.
This is an URGENT APPEAL to join Green Yatra for 'PROJECT - SAHYOG'. We urge you to initiate pan- India campaigns in your offices, schools, colleges, colony, and locality and get each one from your network to act. a) Material: Large quantities of good quality blankets, woolens, tarpaulin, basic medicines, utensils, good quality solar torches, buckets, torch and batteries, umbrellas, water purifier tablets, crutches, candles, rope, mats and such other household utility materials . Please make sure to send the material to the Green Yatra offices once collection is done. c) Logistics support; Material transportation from our offices and additional collection hubs to the affected areas. Green Yatra is also keen to create collection hubs in more cities, if anyone is interested in opening up a temporary centre, do write back to us. Do spread the word. Use your facebook, twitter, e-mail and websites to spread the message. We will be updating status on www.greenyatra.org and on our facebook page www.facebook.com/greenyatra regularly. Do write to us or call 022- 6588 6649 / 099675 38049 for any further queries. Green Yatra is a Non-Governmental Charity (NGO), actively dedicated to Protection and Conservation of Environment and Humanity. Registered and associated with Planning Commission, Government of India, United Nation and tax exempted u/s 80G of the Income Tax Act. strong MS-BI Lead with experience in data modeling is preferred for this Position. Sr. Biz / hands on Tech Lead with excellent Visualization design skills and IT and Biz stakeholders communication skills. • including configuration, writing extensions and plug-ins, deployment. • Must have prior experience in customer interfacing and MDM requirements gathering. • Experience with Oracle data integration, OEDQ or other data quality tools are desirable. • configuring, extending and customizing various components of Oracle MDM solutions. • Lead other implementation team members (integration, data quality, migration, portal) through the implementations. • Build best practices, reusable components and accelerators for MDM implementations. * Strong analytical and problem solving abilities. * Good interpersonal and communication skills and Experience working with all levels of business. I have urgent requirement for you mentioned below. PEGA System Architect is responsible for architecting and designing business applications using PEGA PRPC and other PEGA frameworks. 7+ years of experience in Enterprise Applications with 2+ years of PRPC design and development experience including leadership role in design to develop shared/reusable enterprise rules and workflow components within PEGA Process Rules Commander. • Document code consistently throughout the development process by listing a description of the program, special instructions, and any changes made in database tables on procedural, modular and database level. 1-2 Years of experience in developing customizations using the OA Framework. SFDC with Service Cloud Exp. • Ability to develop application in dashboard and port / share on mobile devices• Minimum two project experience in development of Dashboard using Tableau Server and Desktop. JD: Onsite Cognos Lead. Person should be working on Issue Resolutions logged in the Ticketing system. Prepare Weekly MIS. Senior person required who has good Cognos knowledge. Analyze user requirements through documentation of current processes, analyzing alternatives and redesigning processes to implement the best ELM solution. Identify improvements for processes, standards, deliverables, etc. Candidate should have atleast 2 Informatica master data management project implementation exp.